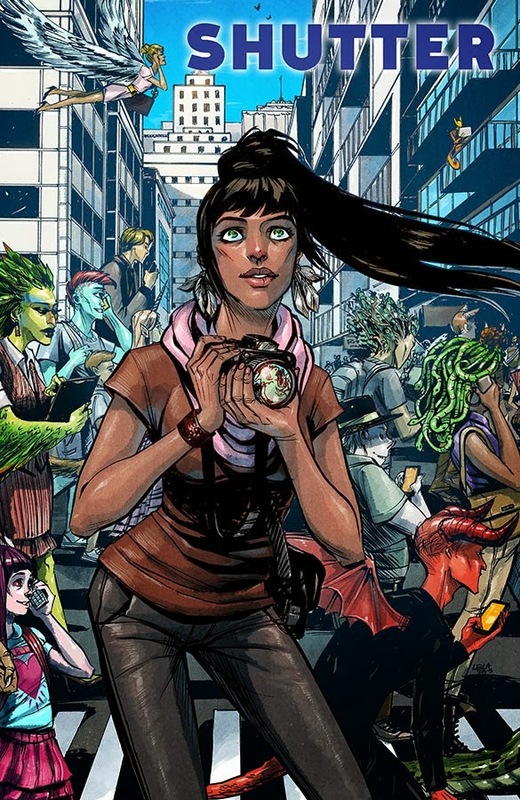 Marvel Knights: Hulk and Glory writer Joe Keatinge teams up with artist Leila del Duca for her Image Comics debut in an all-new ongoing series combining urban fantasy and globe-spanning adventure, SHUTTER. Kate Kristopher, once the most famous explorer on Earth—an Earth that’s far more fantastical than the one we know, filled with demons, gorgons, phantom ninjas, and various other monsters of lore—is forced to return to the adventurous life she left behind when a family secret threatens to destroy everything she spent her life protecting. Kate’s character can be described as a contemporary Indiana Jones. “We’re looking at the 21st Century, where it’s at and where it’s going, and considering what the Adventurer for its time might be like—what would Indiana Jones be like if created in 2014? What’s after Lara Croft?” said Keatinge. “We’re at a much different time than the pulps and serial Indiana Jones and, to an extent, Lara Croft, were rooted in—information from all remote corners of the world comes from great ease, where we’re more knowledgeable about other cultures, where technology enables us to access we could only dream about. Where do you go from there?" SHUTTER is a new, ongoing fantasy, adventure series coming to Image Comics on April 9, 2014, the first issue of which will feature variant covers by Dustin Weaver, Brandon Graham, and Emma Ríos.